*smacks self* ake im stupid. hahah back to the wall ne? BECAUSE IT IS DEDICATED TO YOU ALL^.^ MY LOVELY FRIENDS!! Beautiful work!I just love this scan,and the backgroud is so mysterious. About your voyage,good luck! :D Hope everything turns alright!Come back safe,OK? Your not stupid, I'm so terrible at painting and you did such wonderfull job on the planet. The only bad part of it is that i sense sadness within the picture (its soo powerful) :( . Quote by NakofanIt's soo beautiful. Wow!...that's excellent...The night looks amazing....what's the glowing orb in her hand? The planet look kool,maybe is too big,maybe is just me,but i like it,the trees,maybe u can add more depth (try to duplicate that layer,use a 2.5 gaussian blur and change the opacity between 50% or 70%),and i think the starfield looks a little blurry and dark,the sakura petals look kool,almost like a part of the original scan. The extraction is nice,also the blending,maybe u can change the position of the title,cause i think is to low and the taskbar may cover it. Anyway,overall is a good wall,like i said before i like more than the other version. Very pertty wallie toxictea. :) I love the scan and the background is beautiful. Great job and adding to favs! Wow that's great! Good job!! OMG, you are awsome! (bows)! Keep it up girl! Excellent work! The planet is actually very good (and very nice choice of a background instead of a moon). All of the effects and the bg is beautiful. The character is very pretty and blends with the bg very well. Her expression is rather cute to me. Anyway, Great job! I love it. 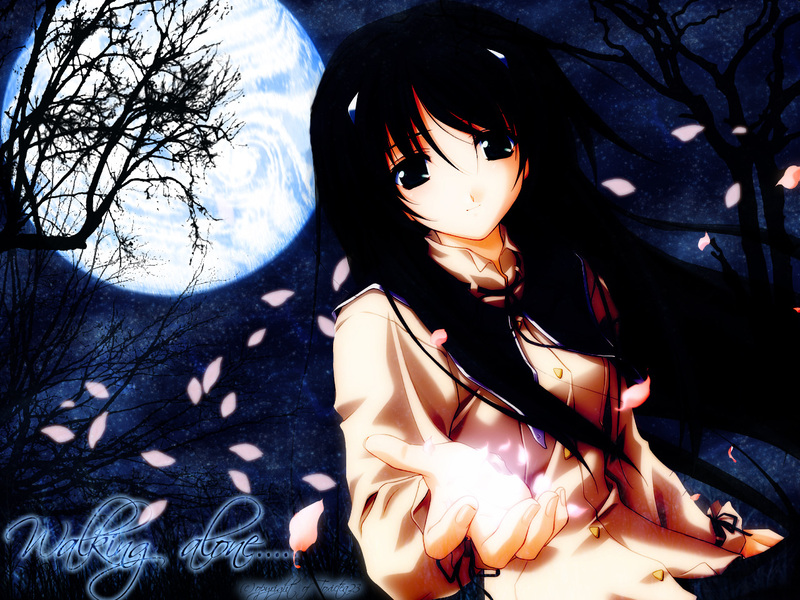 thanks my friend, i love it so much, it is really good, i like the bg and the girl too, the moon is awesome! good luck on your trip and i hope everything goes well ..keep us informed! wow!! nice darky scene! i love the moon the tree!nice sakura petals as well nice job!+fav! How very beautiful. I really like the dark background, you've excecuted some common background elements quite nicely. Wow...very nice. I am quite impressed with this one. Keep up the good work, my friend!